As we head into the lazy days of summer, easy recipes are a must. And when the weather starts to really heat up, I’m all for any recipe that keeps the oven off. You will generate some heat by using the stove top, but it won’t be nearly as sweat-inducing as firing up the big guns. I love a good fruit crisp, but I find the toppings are a bit tricky. There are times when they don’t crisp at all, and others when they burn. Making the topping on its own gave me more control and resolved both problems. Most of the crisps I’ve had were apple, but Mom’s plum tree, that bore fruit for almost 30 years and appeared to stop producing two years ago (as fruit trees do), sprung to live again this season, and there are plums everywhere. So expect more plum recipes. If you don’t have plums, feel free to use any fruit you like: nectarines, peaches, apricots, cherries, etc. Combine the oats, nuts, cinnamon and salt in a bowl. Toss to combine. In a large fry pan, melt the butter over medium heat. 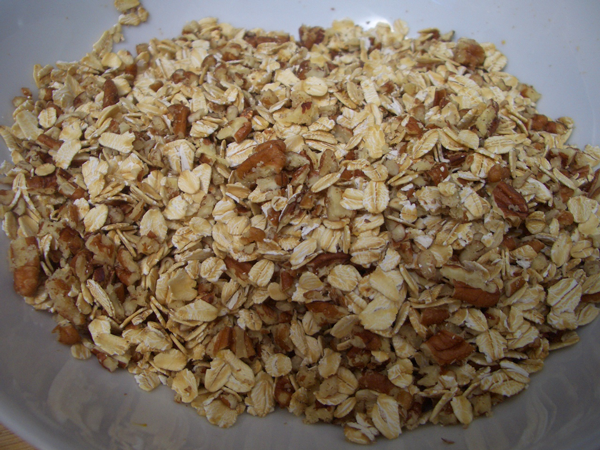 Add the oat mixture and cook, stirring frequently to avoid burning, for about 7 minutes. The oats and nuts will be nicely toasted. Add the sugar, stirring to make sure it is evenly distributed. The sugar should start to melt right away. You want to keep things moving so the sugar doesn’t burn. After about 5-7 minutes you shouldn’t see granules anymore, but little clumps of sugar and oats and nuts. Spread the mixture on a heat-proof plate or baking sheet to cool. Combine the fruit, sugar, cornstarch and lemon juice in a pot and let it sit for 30 minutes. The fruit will start to release juice. Bring to a simmer over medium heat and cook for about 2 minutes until the fruit is starting to soften and the juice has thickened. If the juice doesn’t thicken enough, add more cornstarch by dissolving another teaspoon in a little cold water and adding it to the mixture. Remove from the heat and set aside. At this point everything can be kept for a day–the fruit in the fridge and the topping in an airtight container at room temperature. 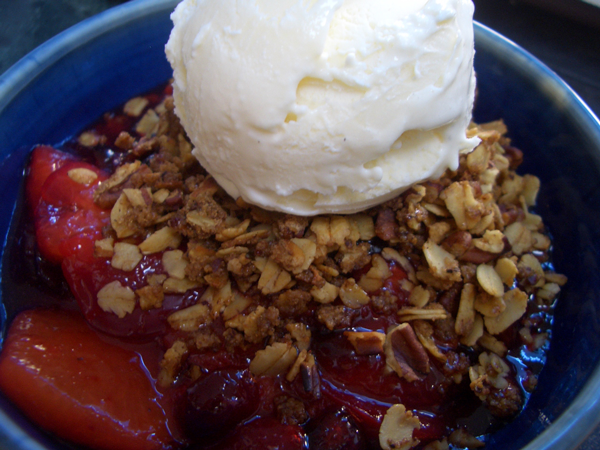 When you’re ready to serve, add about 1 cup of fruit to each dish, top with a handful of the topping, and, if you like, a scoop of vanilla ice cream or a dollop of freshly whipped cream.